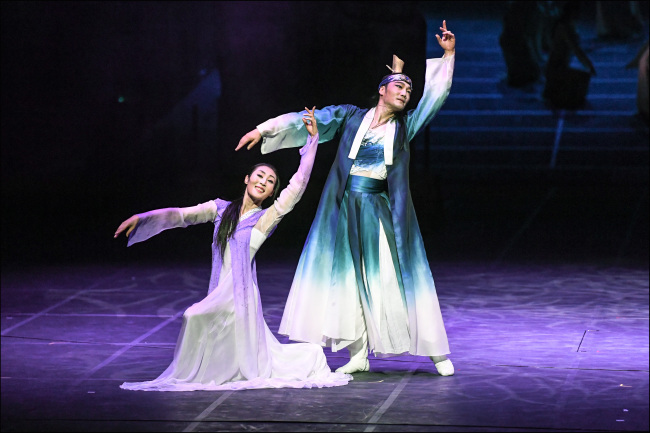 The Seoul Metropolitan Dance Theater’s latest production “Sin-Si, the Festival of the Sun” is the epitome of stage culture fusion, unifying contemporary and classical ballet movements with traditional Korean music and dance. Depicting the motif of the Dangun Mythology through a hodgepodge of dancing styles, the Sejong Center’s newest performance piece tells the 7,000-year-old tale of Hwanung, the son of heaven, who descended to Earth to provide guidance to the rivaling Ung (bear) and Ho (tiger) tribes. Throughout folkloric history, the two tribes are seen at war with each other in an effort to establish Sin-Si -- a new city of coexistence -- with the desire of ushering in a new world of peace. Combining the Western art of ballet and the Eastern art of traditional Korean movements, the grand-scale modern-meets-traditional “Sin-Si” features choreography by Kook Su-ho, one of the country’s most accomplished masters of traditional dance. The program stars leads Kim Joo-won, Lee Jeong-yoon, Yoon Jeon-il, Shin Dong-yeop, Kim Kyeong-ae and Choi Tae-hyun. With an 80-minute running time, “Sin-si” makes for an affordable night out, catering to dance enthusiasts and novices alike. “Sin-si” features a cultural mesh of dance techniques that offers both highly engaging choreography and a much-welcome contemporary twist to boot. It also highlights stunning hanbok, making the production a distinctive live show. Although the main fight scene between the two warring tribes’ leaders -- what would typically have been the theatric climax of such a performance -- was lackluster and anti-climactic, the glamorously theatrical grand closing scene more than made up for the somewhat uninspired battle scenes. 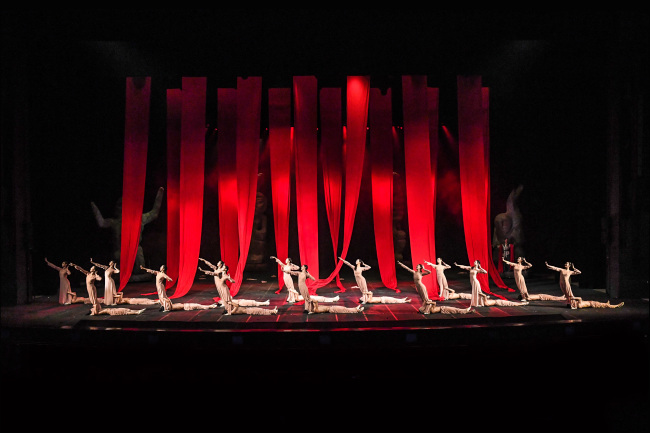 A finale scene where the dancers performed with large, red silk ribbons that fell from the ceiling was one of the most picturesque scenes of the entire production and capped off the show perfectly. “Sin-Si, the Festival of the Sun” will be staged at the Sejong Center’s Grand Theater for two days, on Oct. 27 and Oct. 28 at 7:30 p.m. Ticket prices range from 10,000 won ($8.76) to 50,000 won. For more information, visit www.sejongpac.or.kr.